It's important, if you’re going red that you choose a jacket that nicely enhances the tone of your square. A soft grey, brighter blue or even white colour really work well when you’re ready to go red in your endless pursuit of style perfection. A great tip is to wear red chinos with your pocket square to achieve a subtle flow throughout your entire outfit and if you really want to push the boat out, why not a red jacket of a slightly darker tone, to elegantly match your new accessory? Another kind of matching you can achieve is to your bow tie. A red pocket square and matching bow tie really does look the part, but if you’re a sucker for tradition and prefer to wear a tie, do not and I repeat, do not, wear a red tie, The colour flow is just too much between both accessories, which will not do you any favors in the style stakes. Combine a red pocket square with a tie that matches your chosen jacket’s colour and if you really have to include red, go for a subtle pattern with just a hint of red in your tie. 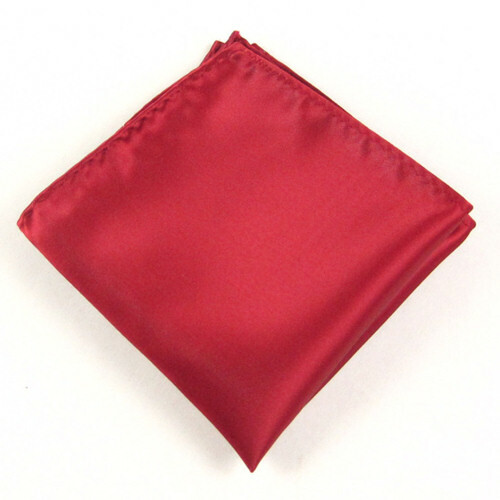 Picking the perfect red pocket square is actually quite simple. A plain red silk will work very nicely in most outfits, but so does a soft stripe or polka dot. A checkered or patterned red can be worn for more relaxed social wears and in wearing both of those a Double Point Roll Pocket Square Fold really gives your look some added fire! Fox and Luther do a great range of red squares and slotting one into your collection need not cost you the earth. Until next time gentlemen, good luck!